Fluffy, cuddly kitty cats are the best. I keep thinking I want to take up kayaking. It would be nice if a consistent thought would stay in my brain. This is what happens when the brain is sleep deprived...such a theme in my life lately. And tomorrow is a football game. Maybe I'll leave at half time. Today's block - Yankee Puzzle - should probably be in red, white, and blue. But it's October. This month it's either orange, black, or pink. Can't break that pattern. 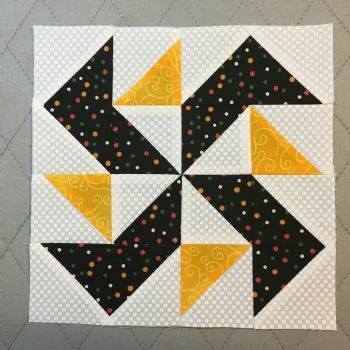 This block goes together surprisingly easily...I had to change my strategy half way through. Enjoy! I really like the contrasts on this block. Well done! I love this one! Keep up the good work!